The 580 metre long Princes Pier was built between 1912 and 1915 and was the third major pier constructed at Port Melbourne. Together with the adjacent Station Pier, it served as a major passenger and cargo terminal in the twentieth century until its closure in 1989. From completion in 1915 until 1969 it was also a major arrival point for new migrants, particularly during the post-war period. In addition to a pier, there was a gatehouse and barriers, terminal building, amenities rooms, goods lockers, ablution blocks, railway sidings and passenger gangways. From opening the pier was linked by rail to the Port Melbourne railway line. With the containerisation boom the pier became unused, being closed to public access in the early 1990s due to the poor timber condition, and squatters caused a fire in the late 1990s that destroyed the store structures. Restored and modified to allow safe public access, Princes Pier reopened in 2011. It was known as the New Railway Pier until renamed Prince's Pier after the Prince of Wales (later Edward VIII) who visited Melbourne in May 1920. This image belongs to the travel and nature stock photo library. This stock photo of Princes Pier at Port Phillip Bay is available for licensing for commercial and editorial uses including websites, blogs, books, magazines, brochures and advertising. Restrictions may apply for images which contain third party copyrighted material or sensitive subjects. Photos of artwork are for editorial use only. 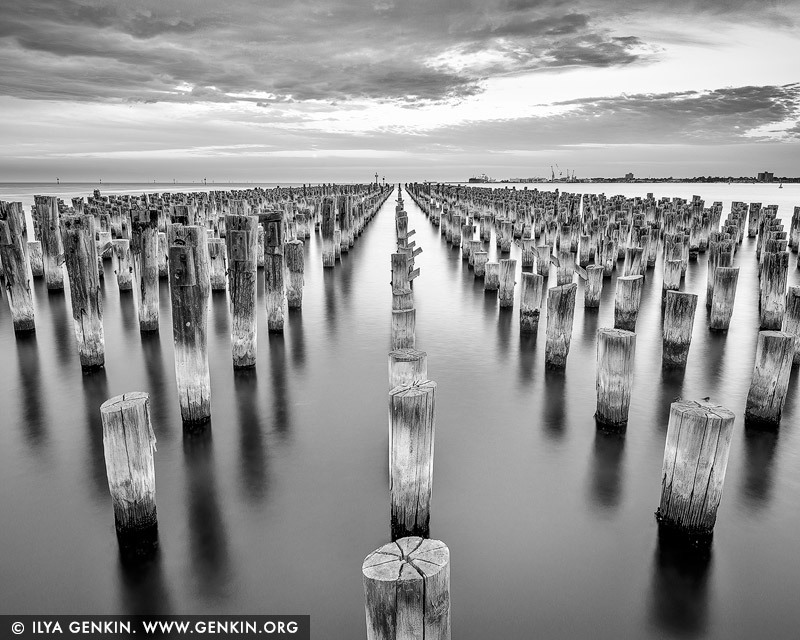 This image id AU-MELBOURNE-0038 of Princes Pier at Port Phillip Bay, is copyrighted © by Ilya Genkin. This is not a public domain image.